The staff was very friendly and helped aid any questions we had. The pool area was perfect for a surprisingly sunny day in April. 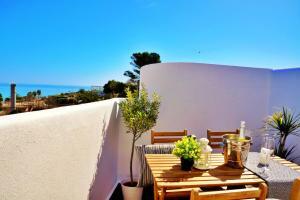 Location was very convenient, close to the beach and to the town. The little apartment was perfect for a relaxed stay and he views were amazing. The man that checked me in was so friendly and helpful. Nice place, very good location, friendly staff, Thank you Antonio for the help and kind reception! Large room with quite good cooking facilities. Very nice shower. Very comfortable bed. Friendly and service minded staff. Everything was great. Very friendly and helpful receptionist. Everything was great. Very well maintained and comfortable. The staff are very friendly and helpful and take care to make your stay comfortable. 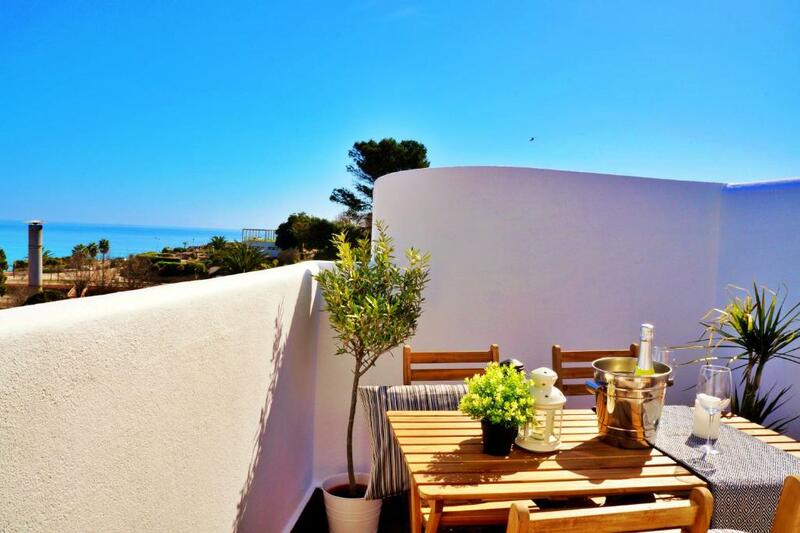 The apartment is at the south edge of the old town just inside the town walls which makes it a quiet place to stay, but an easy walk to restaurants and near the start of the trails to Ponta da Piedade. Just be aware that it requires a bit of a climb up the hill. If we had known, we would have taken a taxi with our luggage to get there, although the walk back to the bus station was easy going downhill. The view of the sea is lovely. Too cold in November to try the pool. Great location within the old walls of the city. Very nice people working who speak English well. Kitchen space works well for families. I stayed here 22 years ago as a teenager and so was excited to stay here again during our 10 days in Lagos. I’m happy to say that our experience was even better than I remember as a child, the rooms were spacious and the bed was huge, the shower was great and there were some English channels on the tv. Our balcony overlooked the pool and the beach! Jessica at reception was always very sweet and helpful. The location is great for access to the beaches and the main strip. 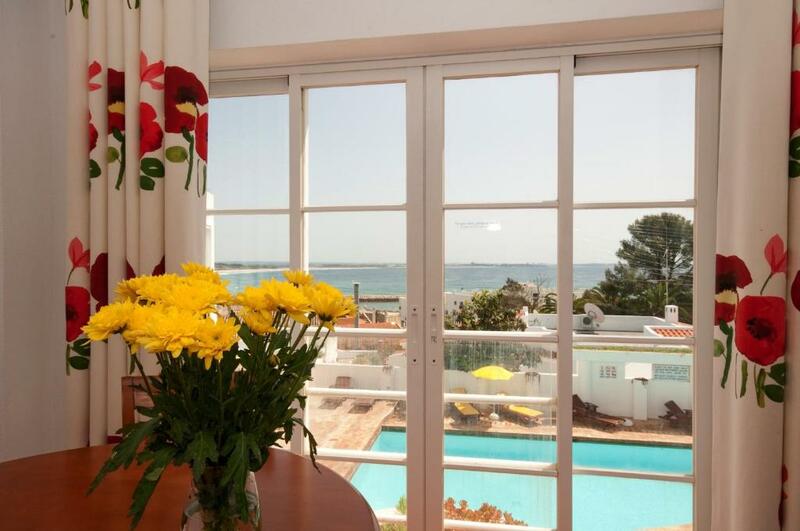 Lock in a great price for Baluarte da Vila Apartments – rated 9.2 by recent guests! Baluarte da Vila Apartments This rating is a reflection of how the property compares to the industry standard when it comes to price, facilities and services available. It's based on a self-evaluation by the property. Use this rating to help choose your stay! One of our top picks in Lagos.Located in the historical center of Lagos, Baluarte da Vila Apartments is only 1,650 feet from a sandy beach. 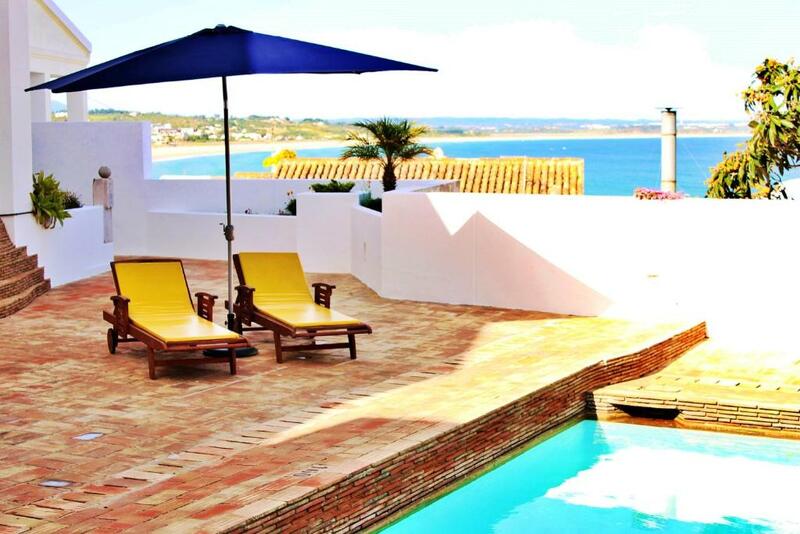 It features a pool with views of Lagos Bay and offers self catering accommodations. Some Baluarte da Vila's apartments and studios boast furnished balconies with views of Meia Praia. They include modern furnishings and come equipped with air conditioning and a flat-screen TV with satellite channels. Guests can relax on a sun lounger poolside and enjoy a refreshing beverage. Several restaurants serving fresh seafood and regional cuisine are a 5-minute walk from the hotel. 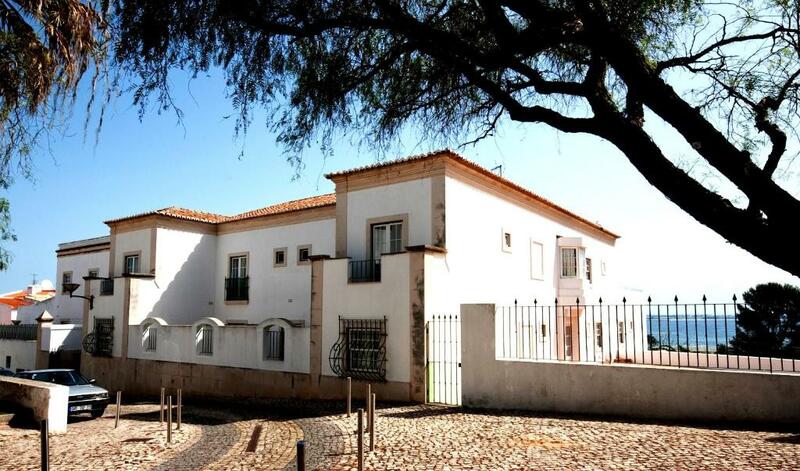 Baluarte da Vila is located 0.6 mi from Lagos Train Station and is 2-minute walk from the Church of Saint Anthony. This is our guests' favorite part of Lagos, according to independent reviews. This property also has one of the top-rated locations in Lagos! Guests are happier about it compared to other properties in the area. This property is also rated for the best value in Lagos! Guests are getting more for their money when compared to other properties in this city. 뀐 Located in the real heart of Lagos, this property has an excellent location score of 9.6! When would you like to stay at Baluarte da Vila Apartments? Featuring a furnished balcony with views of the Atlantic Ocean, this spacious studio offers a flat-screen satellite TV. The studio has the capacity for up to 2 people. The accommodations offers a small seating area, a kitchenette, a private bathroom and a small balcony where guests can enjoy the sea view. The one-bedroom apartment has the capacity for up to 2 adult and 1 children. The apartment offers a small seating area, a complete kitchenette, a separated bedroom and a private bathroom. Guests can enjoy a partial sea view from the bedroom window. This 1-bedroom apartment has capacity for up to 2 adult and 2 children. The 3-floor apartment offers a small seating area, a complete kitchenette on the ground floor, a separated bedroom and a private bathroom on the 1st floor. 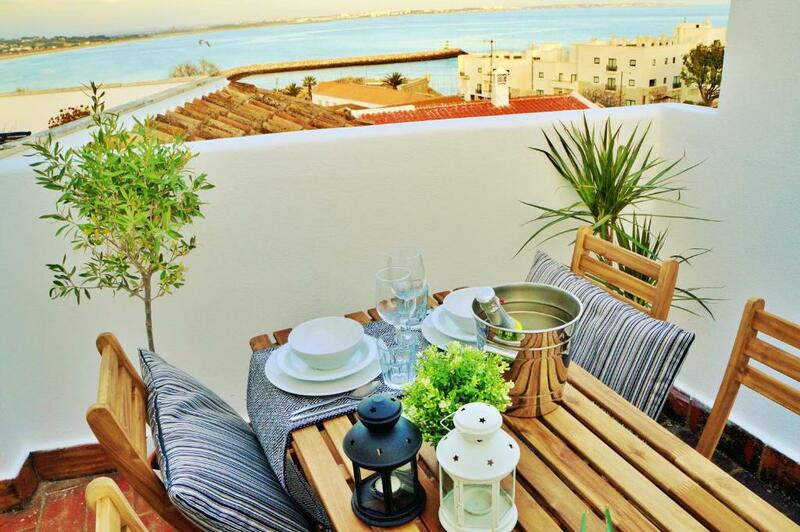 It has a large rooftop terrace where guests can enjoy views of the bay. This apartment has a kitchenware, stovetop and microwave. This apartment features a toaster, kitchenware and air conditioning. The Baluarte da Vila Apartments is distinguished by preserve lines that refer to the historical architectual concept of the town, including his connection to the Portuguese Discoveries. The Baluarte da Vila is situated in one of the town's hills and offers a privileged view over Lagos and its magnificent bay. House Rules Baluarte da Vila Apartments takes special requests – add in the next step! Baluarte da Vila Apartments accepts these cards and reserves the right to temporarily hold an amount prior to arrival. Guests need be quiet between 10:00 PM and 9:00 AM. Please let the hotel know your expected time of arrival. You can use the special requests box when booking or contact the property. Late check-in is possible upon request. Please note that the aparthotel is not suitable for people with reduced mobility. Please note that the aparthotel does not have private parking. During high season months parking may be diffucult. Please inform Baluarte da Vila Apartments of your expected arrival time in advance. You can use the Special Requests box when booking, or contact the property directly using the contact details in your confirmation. We stayed in the 3 level apartment. The couch was plastic-like and not comfortable. The decor and feel seemed dated. There were plastic chairs on the terrace, where it would have been nice to have more sturdy ones that weren't cheap looking. Also, it was a bit disappointing that the hot tub closed at 5pm. In fact, we witnessed two staff members come out at 445 while a gentleman was soaking and they just looked at him until he got out and then they closed it early. Would have loved to have coffee included, rooms have coffee maker but no coffee :( rooms have little kitchens for one to make their own breakfast but would be nice to have some staples included (like salt, pepper, oil, etc) to make it easier. It’s a little outdated, but very clean and comfortable! Excellent location near the old town. Was a hill to walk up to it but that didn’t bother us at all. Jessica the receptionist was first class and was really helpful. The apartment was really good value for money! Nothing,- Be aware that rooftop rooms are 3 level rooms with small stairs if you have problems with walking. We had a room with rooftop terrace. Fantastic view to old town and ozean. Perfect location, a view minutes walking to old town and to beaches. Clean and comfortable. Very nice staff, help you with everything. The room was cleaned every day but not very good. Kitchen, tables and bathroom were not cleaned, only the floor was wiped. But if you know that, it's ok. There were many steps on the way to our apartement and also in the apartement. If you are traveling with a baby it is a little complicated sometime but you can leave the stroller at the reception. We stayed here in April so it got still cold at night. But there were heaters in the living and the bed room. The bathroom and the hall were still a little cold, but I think that is normal for almost all apartements in that area. The apartement is situated in an excellent location. It is still in the old town of lagos, you can easily walk in 2min to all the restaurants, shops and bars but at the same time it is quiet. The only thing you hear all day are the seagulls over the roofs of lagos. 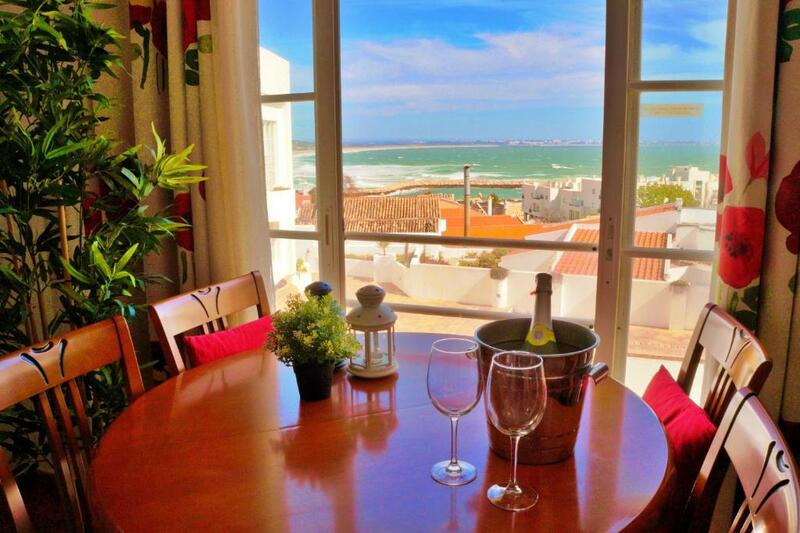 We had a roof top terrace with a spectacular view over lagos and the beautiful beach Meia Praia. You can walk easily to nice beaches and parking our car was also pretty easy. Supermarket is also a 5min walk away. We would stay here again! We made breakfast in the apt each day and while it was well equipped appliance wise, there were no basic supplies (salt, pepper, plastic wrap, paper towels) so be sure to bring all the basics if you plan to eat in. We looked forward to using the spa tub since the pool was too cold for swimming, but it could only go up to 27 degrees. 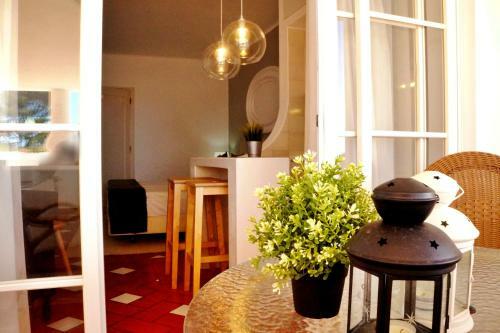 Very spacious apt with 2 baths, large rooftop terrace and balcony off living room. Gorgeous view of ocean and beach from rooftop terrace! It would have been so nice to have high bar stools/table there to enjoy the view over the terrace wall without having to stand. Jessica is spectacular! So helpful and willing assist in finding anything in Lagos. The 1 bedroom apartment is so much more roomy that expected. The first floor is the kitchen/dining/sitting area with a bathroom. The second floor is a very large bedroom with a another bathroom. Then there is the bonus third floor which is an outdoor patio and sitting area. The apartment is older but well kept and clean. The location is fabulous, in the walls of the old town and walking distance to the beach. It was quite cold at night and no way to heat the room. The bathroom had a slightly bad odour from the drains. Very comfortable stay. Quiet and restful. Very helpful staff. Would definitely stay again and recommend to friends/ family. Great location - friendly staff.